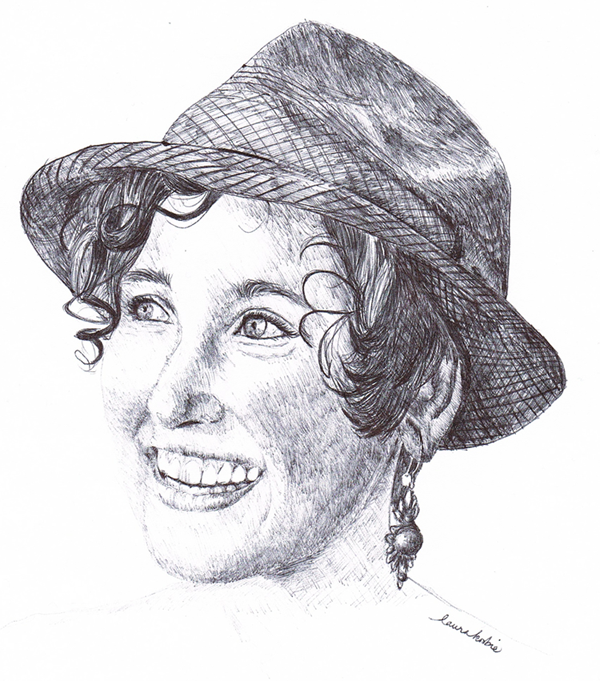 Laura Kosbie drawing of Hannah, based on a photo by Leah Crubel. This Friday night poet Hannah Adams will take Alley Stage and share not just her words, but also her dreams of home. Specifically, a tiny home that she is in the process of planning and building. What is a “tiny house”? Some quick, non-scientific research tells me that since 1978, the average size of a single-family home has nearly doubled to about 2,500 square feet. Meanwhile, a countermovement of simplicity and downsizing has given rise to a small house movement, which features homes less than 1,000 square feet and some as small as 100 square feet. 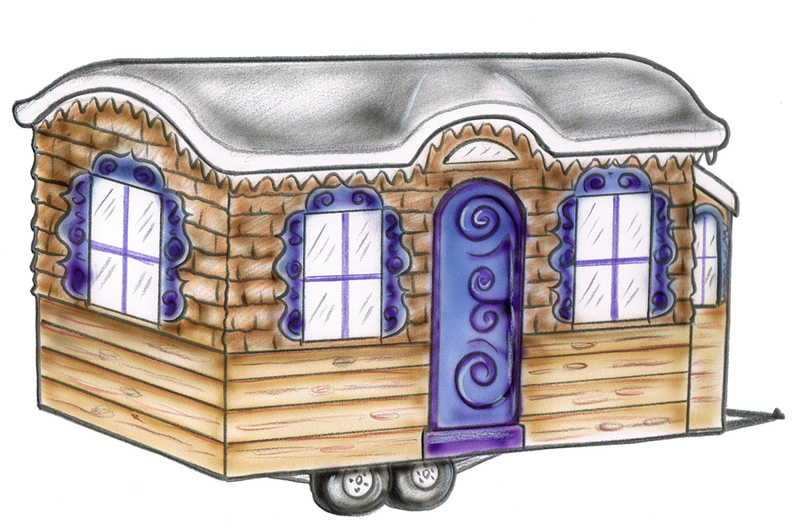 Some tiny homes are on wheels, many are not. Some examples of tiny houses. Personally, I live in the exact opposite of a tiny house, but I admit to fantasizing about living in a one-room cabin or one of those micro-apartments on display in an Ikea showroom. Everything is so necessary, so sparse, so well-designed. No room for all that stuff. Not pictured in this Richard Scarry drawing that my tiny house just might resemble: Bathtub, five bicycles, a trailer and two boats. You’ve performed your spoken word poetry in the area, but this is your first show at Alley Stage. What can the audience expect? The show will last for an hour, and during it I’ll weave together spoken word poetry with different stories and examples from my tiny house project. I’ll be using a projector (a la TedTalks style), as I do much better with show and tell! During intermission, everyone will have the opportunity to walk through a taped out version of my tiny house floor plan. Why a tiny house on wheels? Why not an RV or an Airstream? Here’s an excerpt from my newest book, “Luna: a tiny house grows up,” where I’m responding to that very question. Drawing “Luna,” Hannah’s future tiny house, by Ron Moraga. Tiny houses are unique from travel trailers in that they are constructed with quality materials, significantly lowering: heating and cooling costs, use and offgassing of toxic chemicals. Plus, when I look at a tiny house, I’m overcome with the sensation of home. The way a space aesthetically feels to me is really important. I think beauty, and the way our surroundings inspire us, is important. Also: RVs and Airstreams have not been designed to be an expression of my daily movements. One example of this is with my tiny house design, I have room to practice yoga and use my massage table. Where are some of the favorite places you have traveled? Oh, the places we’ll go! Three of my favorite places on earth: Missoula, Montana (with beautiful people and the great big sky). Mount Shasta, California. Zig Zag (or Rhododendron), Oregon in the spring. The glowing waters of a bioluminescent bay on Vieques (one of Puerto Rico’s islands), El Yunque National Forrest and the beaches of Culebra can all duke it out for fourth. And where do you see your tiny home on wheels taking you? I’ve been looking into some different herbalism apprenticeships around the country, and there are quite a few that sound intriguing. I’m about to start massage school next month, and am excited to weave it together with the knowledge of local plants. New Mexico is on the top of the list. There’s a whole side of my family and history originally from the Southwest, and I’d love to discover that. Plus, there’s an amazing worktrade herbalism possibility with Kiva Rose, one of my favorite herbalism bloggers. I plan on coming back to Wisconsin once I’ve learned many skills, met many people, heard many stories. As I didn’t grow up around extended family, I’d love to give my some-day kids the gift of nearby aunts, uncles, cousins, grandparents. Family and community are such powerful realities. You are truly a unique person. After I talk to you, I leave with a feeling of warmth and kindness. Even your voicemail has that effect. Do you get this response from a lot of people, or is it just me? I hope we can all be mirrors for each other, shining back a person’s own beauty. You made my day with that comment! I think we are drawn to and connect with people who are living their Truth, loving themselves, and letting it spill out to the world around them. I’m not always there – but on the days I remember, it’s magic. You can virtually connect with Hannah on pinterest and tumblr, follow her on facebook, e-mail her at hannahradams@gmail.com, and explore her website. Or you can see Hannah in real person at 7:30 p.m. this Friday at Alley Stage. To buy tickets, go here. Tickets also may be available at the door. Box office opens at 7 p.m. In the event of rain, the show will be performed in the Shake Rag Alley Quonset Hut. For information, call the Shake Rag office at 608.987.3292 or check their Facebook page. This entry was posted in Entertainment and tagged Alley Stage, Hannah Adams, Mineral Point, poetry, tiny house, Wisconsin. Bookmark the permalink.